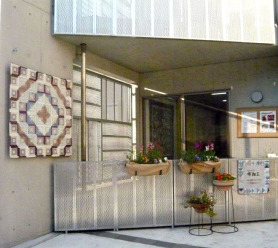 spacer.gifQuilt Studio NUNOZAIKU was estublished in Shibuya,Tokyo, in 1990. The quilt school and quiltmaking are the main business. A members’ quilt show is held every other year. 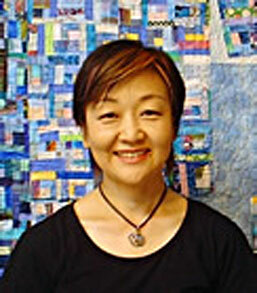 Noriko Koyama, the leader of NUNOZAIKU, graduated from Joshibi Art University and worked as a commercial interior designer before opening her quilt studio. She was a finalist five times at the AQS Quilt Contest in the U.S.A. and awarded the Gold prize and Silver prize in the Banshu-ori Patchwork Contest in Nishiwaki, Hyogo. 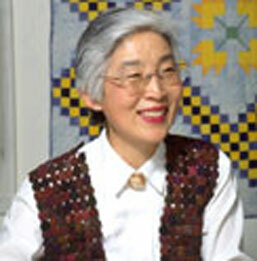 One of Noriko’s wearable quilts was shown in the International Quilt Fashion Show in the U.S.A. in 1996. Her work has also been featured at the Quilt Expo Fashion Show in Germany in 1997. Noriko was a part of the New Horizons Quilt Show at Himeji City Museum in Himeji, Hyogo, from 1996 to 2001 and takes part in the Hearts and Hands Quilt Festival in Shibuya, Tokyo, almost every year. Noriko holeds Japanese quilt show with her students and Miwako Kimura, Japanese quilt maker biannually at the La Conner Quilt & Textile Museum, WA. U.S.
She teaches quilt making of all of the field. Kazuko Yoshiura, sashiko teacher for the advanced sashiko classes of Nunozaiku, started sashiko in 1979 and began teaching sashiko in Azabujuuban, Tokyo, in 1983. Her works are published many books such as my Room, Home Decoration, Patchwork Tsuushin, Japanese Quilts, and Changing Season. She has held private shows, group shows with Noriko Koyama or other quilters many times and conducted workshops at Pacific International Quilt Festival, SF, U. S.
She now lives in Ito, and teaches sashiko in Ito, Shizuoka.